Imagine a world without any hedgehogs. Sadly, if things keep going the way they are, this is a very real possibility in the not too distant future. Hedgehog numbers have been declining across Britain for some time and they are still going down. 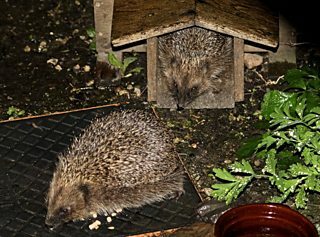 Current estimates put the population of hedgehogs in the UK at less than one million. 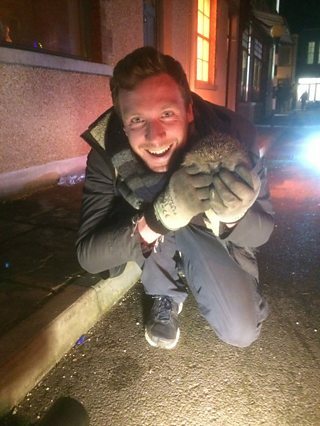 The plight of the familiar hedgehog is something we have covered on the Watches many times before, and the films tend to take a familiar pattern; presenter walks along a street, explaining the plight of the hedgehog, before visiting someone who is looking after sick and orphaned hedgehogs and often releasing one back to the wild. Made in 1982, 'Blade Runner’ imagines a dystopian future in which humans are on the verge of extinction – a story that has obvious parallels to the plight of the hedgehogs. If you know the film you will also know that it has a unique, some say groundbreaking, style and one that is quite different from how we would normally film wildlife. The ‘neo-noir’ look is something I thought would help accentuate the problems the hedgehog faces, but staying true to the style whilst still telling a compelling story was a tricky balancing act. We wanted to depict our hedgehog roaming the streets, bathed in the neon glow of the city while people go about their nightly routine unaware that a little mammal is struggling to find food and a place to sleep. In order for us to be able to show the many dangers a hedgehog encounters we had to film them on a closed set to ensure their safety. We spent a long time looking for sets, but ended up finding one in Wales that was perfect for what we wanted. It had been built to look exactly like a real city street and even came with realistic houses and gardens. It was the perfect place for our stunt hedgehogs to wander around and encounter common obstacles whilst staying safe as we worked through our shot list. We also took multiple hedgehogs with us, to give each one an opportunity to be a star and also to give them a break from filming. Plus it also provided us with a guarantee that at least one of them would perform! The next hurdle was to figure out the best way of showing the hedgehogs in scary and dangerous situations without actually putting them in harms way. We used a camera technique called ‘forced perspective’; which makes an object appear closer or further away than it actually is. 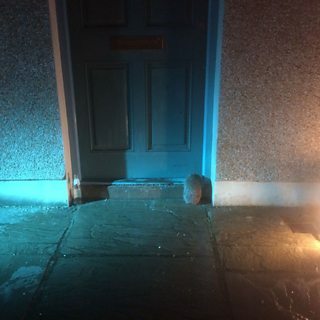 This technique, now a well-known trick, enabled us to have the hedgehog appear to be in the close path of a moving car when in fact it was tens of metres away. Similarly, in this shot, the distance between the hog and these slug pellets was 2-3 times further than it appears here, due to the technique used. Aside from just depicting the dangers the environment poses to these animals, we also wanted to try and capture some real animal behaviour - one of which is called 'self-anointing’. This was one of the hardest things to film, as we did not know what the hedgehog would like to use to ‘self-anoint’, or when it might do it. We were delighted when it happened by chance as we were filming the hog walking past a greasy old car jack. As the hedgehog approached it began to lick the grease from the jack and use it to it coat its spines. We were amazed as the hedgehog did this right in front of us! It turns out hedgehogs have used even stranger chemicals to self-anoint with such as creosote! We don’t know exactly why they do this; but it’s possible that the odours disguise their smell to potential predators. This closed set filming had other benefits. 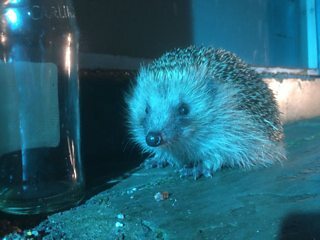 For me personally, seeing the hedgehops wandering happily around looking for food reminded me of when I used to see them in my home town when walking home at night. Sadly I haven’t seen them there for some years now. The plight of hedgehogs is something that I wanted to show in an emotional way, capturing what it might be like from a hedgehog’s point of view to live in a man-made world. It appears that there’s not just one factor causing their decline, but a culmination of several. I hope this film will place the plight of the hedgehog into people’s minds so that we can all work together to save this beautiful and enchanting mammal before it’s too late. Snow, glorious snow! Hang on... It's spring, right?! Springwatch, Autumnwatch and Winterwatch Blog. A place to talk UK Nature.